Attleboro is a relatively young program that is looking to build on a talented group of returning players, particularly in the attacking end of the field. New head coach Chrissy Quinn has a dynamic group of attackers that she is hoping will build on last season’s 113 goals, which was the second-lowest goals tally in the league. The key player in the midfield and attack is senior Kyra Lyons, who accounted for nearly half of the team’s goals last spring despite drawing the attention of opposing defenders. Lyons will be joined by senior midfielder Rylee Fontes, a Worcester State-commit, who adds a secondary playmaker around the opponent’s goal. Junior attackers Sydney DiLiddo, Kelly Johnson, Rylee Turnes, and Ashley Piazza will get helped by sophomore Hannah Webster, Campbell Compton, and Isabella Salviati. On the defensive side of the ball, seniors Sam Fasoldt and Sydney Viera will be the leaders of the back line, trying to protect sophomore Maggie Porreca and junior Dee Graham, who will both see time in goal this season. Juniors Julia Willis, C.J. Westwater, and Lynn McDonald will also be jumping into the defensive unit to add depth at the back for the Bombardiers. Like many of the teams in the Davenport division, Canton comes into the spring eyeing a return to the state tournament. The Bulldogs last made it in 2016 after finishing in a three-way tie for second behind Foxboro in the Davenport division. With a mix of new faces and experienced returning players, second-year coach Laurie Chabot is hopeful that this season with see Canton make a run up the standings. Canton will have a lot of experience in the defensive unit even after graduating a few key pieces. Senior Molly Cummings will be the leader at the back and will be joined by classmate Devyn McGrann and freshman Sydney Gallery, whose twin sister Fay will jump into the midfield this season. Junior Alexa Maffeo and seniors Maggie Connolly and Leah McLellan will also be critical for the Bulldogs to take control of the middle of the field and transition from defense into attack. Communication at the back will be key. There are several new faces in the attacking unit but Chabot is already seeing that chemistry is building. She was pleased with results in the preseason and is hoping that confidence will carry over into the games that count. Expectations may be as high for this year’s Foxboro team as any under head coach Brittany Sherry because the Warriors have a roster filled with talent and experience (14 returning seniors). Foxboro will be looking to clinch an eighth straight league title but also will have its sights set on bringing home the program’s first sectional title as well. With the weapons at the Warriors disposal, there is the potential for plenty of silverware to come their way this spring. It all starts with two-time reigning Hockomock League MVP (and reigning HockomockSports.com Player of the Year) Sophia DiCenso. The senior midfielder has spent the off-season playing with the youth national team and will be the cog on which the Warriors build their attacks. She is joined in the midfield by classmate Molly Murphy, who is closing in on 100 goals in her career, juniors Abby Hassman and Jamie Notarangelo and sophomore Ella Waryas, who each provide Foxboro with solid two-way play. In attack, seniors Meghan Curran and Caroline McGeary have consistently provided goals in big games and sophomore Lilly Vey is a newcomer to watch this spring. The loss of Alex Stamatos to injury will be tough on defense, but senior Carlie Stern will provide the leadership for an experienced group that includes seniors Mary Spillane and Jenna Stamatov and junior Grace Boudreau. Of course, if anyone gets through then University of Louisville-commit Sara Addeche will be waiting in goal. It is a sign of just how far the Franklin program has come that being knocked out in last season’s East semifinal could almost be considered a disappointment. After winning the East title in 2016 and 2017, the Panthers come into the spring with another roster loaded with talent and experience and a schedule loaded with the top teams in the state to prep for a deep tournament run as well as trying to make it eight straight league titles. Senior Annie Walsh will be the focal point for the Panthers again this year and the player that the offense typically runs through. Her sister Erin, a junior attacker, is one of the best finishers in the league and gives Franklin a dynamic one-two punch on offense. Junior Kelsey MacCallum adds another talented attacker to the forward line, while senior Hailey Toolin adds versatility as either a midfielder or defender and junior Alex Field will be a key piece of a defensive unit that was by far the best in the Hock last season. Junior goalie Gianna Cameron is another reason for the Panthers having such a strong defensive record after two straight seasons on the HockomockSports.com First Team. The Panthers haven’t lost a league game since 2012 (more than 70 straight wins) and have added an exciting freshman class with loads of potential, including six players making the instant jump to varsity. Under first-year head coach Kourtnie Wilder, King Philip built on the momentum of its run to the 2017 East semifinal to put together a 14-win season and finish comfortably in second place in the Kelley-Rex division. The Warriors took Franklin to triple-overtime, coming as close as anyone has in recent years to ending the Panthers’ long league win streak, and battled with Lincoln-Sudbury in the East quarterfinal. Now, KP is hoping to use that experience to make a run at ending Franklin’s dominance in the division. The key for KP may be the attack, which returns a lot of goals from last season. Senior Caroline Klim is back and will be a player that opposing defenses will have to watch out for after leading the league with 73 goals last season, including nine against Sharon in the playoffs. Klim will be joined up top by classmate Dana Truini and junior Jessica Sullivan. Defensively, Wilder points to the team’s aggressiveness and communications as being the keys to building on a season in which the Warriors only allowed 153 goals, which was second-best in the Hock. Senior Victoria Tormey, a HockomockSports.com First Team defender last season and Boston University-commit, will be the leader at the back and will have classmate Caroline Watson back in goal behind her to make a formidable group for opponents to break down. New coach Lauryn Wilkie takes over the program this spring, looking to push an experienced Mansfield roster up the league standings, challenge Franklin at the top of the division, and make another run at a state tournament berth. The Hornets will be counting on its 11 returning seniors to keep things heading in the right direction this spring. Senior attacker Katie Garvin will lead the forward line again this season after being among the league’s top scorers in 2018. Seniors Lauren Whitman and Maggie Danehy bring verve, energy, and experience to the Mansfield midfield, covering on draw controls and the transition game. Seniors Emily Vigeant and Kylie Tryder will cover the back line just in front of senior goalie Katie McCarthy, all of whom have multiple years of experience on varsity and should be a strength of the team. There are some underclassmen who will contribute right away for the Hornets, including sophomore midfielders Annemarie McCoy, Abby Varricchione, and Grace Fernandez and sophomore defender Melissa Shanteler. Milford has a number of players back and a new head coach, Nicole Serra, looking to make a quick turnaround from last season in which the Hawks won only twice overall. With an athletic group back, Serra is working on building chemistry and putting the players in position to take advantage of their speed in transition. After scoring a league-low 82 goals last season, the attack will be a primary area of focus this spring. Seniors Emily Haley, Katie Drysdale, and Sophia Bucal will give the Hawks leadership on the field, with Bucal providing a vocal presence in the attack. Senior Briana Maietta will join Bucal up front and they will be helped by junior midfielders Annie Flanagan and Elena Bon Tempo, who add athleticism whether in the attack or tracking back to help out on defense. Junior Hannah Bangert will be the leader at the back, controlling the defensive zone, along with sophomores Katie Maietta, Jillian Michelson, and Eva Parson. While North Attleboro finished below .500 last season, the Rocketeers only missed a postseason berth by a single game, ending up one game behind Sharon and in third-place in the Davenport division. Second-year coach Colleen Carchedi, who came over from Sharon last spring, is counting on the team’s young core (and the new turf at Beaupre Field) to help North get back into the postseason hunt and even challenge Foxboro’s reign at the top of the division. Senior attacker Alexa Sinacola and senior defender Lauren Pezzi will be leaders on either end of the field, but North also has a strong junior class that will be counted on to produce this season, especially after the graduation of perennial all-star Kenzi Rosenberg. Junior Katie Lindstrom will be the focus of attention in the midfield after committing to UMass Lowell in the off-season, but she will have help from classmates Kathryn Kayata, Regan Fein, Lily Cameron, and Lindsay Spratt. Junior Faith Graveline will step into goal to try and help Pezzi lock down the defense along with sophomore starters Camryn Gonrdell and Aimee Baiungo. Sophomore Maggie O’Brien will add a spark to the attack. Oliver Ames continues to build the depth within its program to try and get that elusive berth in the state tournament. The Tigers have won eight games in each of the past three seasons, making the postseason in 2016 and narrowly missing out by two wins each of the last two years. This spring, OA will send out a relatively young squad that will look to get the Tigers over the hump and into the playoffs. While there is plenty of youth on the roster, OA has leadership from a core of experienced players, including senior midfielder Olivia Piazza, who was on the HockomockSports.com Second Team last year and is committed to Merrimack College. She scored 91 points last season and will be the engine at the heart of the OA midfield. Senior Maddie Kullen will be in goal this season for the Tigers and classmate Grace McCallum returns to lead the defensive unit. Sharon has made the playoffs each of the past three seasons and has gone 7-3 in league play for the past two years. It has been an unprecedented run of success for the program and the challenge for the Eagles is to keep that momentum going even with the loss of key players to graduation. Second-year coach Shara Ginthwain will hope that new players can step in and that the team’s chemistry and effort will allow Sharon to continue battling at the top of the Davenport division standings. Senior midfielder Emma Eberhardt is the key to the Eagles staying on track. The Lehigh University-commit scored 69 goals last year, including five against KP in the playoffs, and has been one of the top playmakers in the league the past three seasons. Eberhardt’s normal running mate in midfield, Sabrina Robbins, is now playing at the University of Colorado, so it will be important for her to build a rapport with sophomore Jenna Goldstein, who had an impressive rookie campaign, and senior Maeve Barbera. Senior goalie Rose Wald will be back between the pipes and classmate Bridget McManus is back to guide the defensive unit after being a HockomockSports.com Second Team performer last spring. Sophomore Molly McAlevey is a newcomer in defense to keep an eye on. Taunton has been on the verge of getting into the postseason in each of the past two seasons, missing out by just two wins last year, including a one-goal loss to Canton and a pair of non-league losses to New Bedford. With a young crew coming into this spring, the Tigers will be looking to improve their performance in the league (2-8 in the Hock in 2018) to push themselves into the postseason conversation. The key for the Tigers is sophomore Alana Tavares. 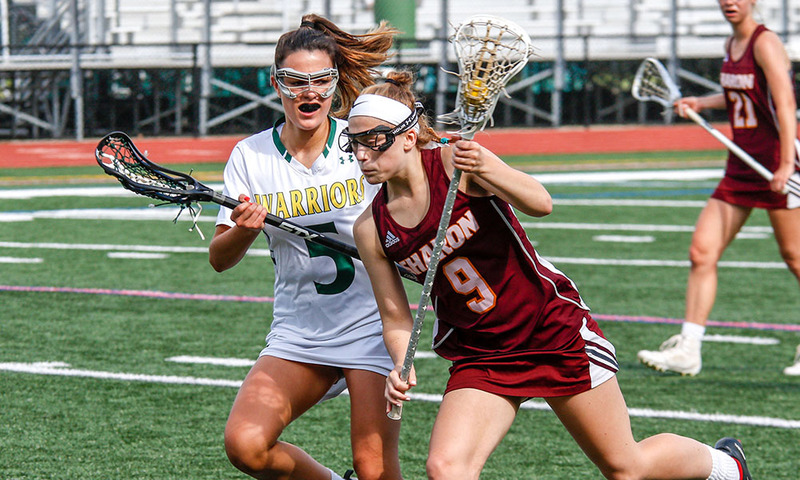 The three-year starter has been one of the league’s most dynamic attacking threats since jumping onto the varsity scene as an eighth grader and so much of the Taunton attack runs through her. Junior Kamryn Li is also back for the Tigers after scoring 23 goals last season. The only seniors on this year’s team are Emma Sheehan and Mabel Smith, but Taunton will have 10 sophomores, eight freshmen and an eighth-grader on this year’s roster, so the underclassmen are going to have roles to play right away this spring.